Many deciduous trees and shrubs in various types of rural and urban tree stands and plantings. Damage by the Fall Cankerworm usually begins in late May when young larvae chew small holes (shot-holes) in the developing leaves. As feeding continues, these holes gradually enlarge until only the larger leaf veins and midribs remain. 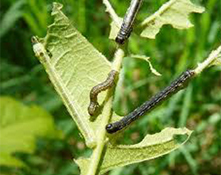 When cankerworm populations are large, starving larvae in search of food, may drop on silken threads and become a nuisance around homes or in well-used areas. During outbreaks lasting from 1-4 years, trees may be completely defoliated; however, most trees usually refoliate in July. Severe defoliation over several years may also contribute to tree mortality. The Fall Cankerworm has a 1 year life cycle. Their larvae are slender and move with a looping motion. Fall Cankerworm eggs overwinter on host trees and hatch into larvae in late May when they begin feeding as the new leaves unfold. When fully mature at the end of June, they are 25mm long and vary in colour from light green to dark brownish green, with longitudinal stripes. The mature larvae drop to the ground, spin cocoons in the soil and pupate in the soil. They emerge as adults in October. 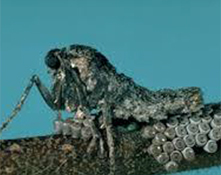 Adult females are wingless, grayish brown and about 12 mm long. The adult male moths have wings with a span of about 30mm. The adult females climb host trees and shrubs to mate. Each female then lays about 100 eggs on the upper twigs and branches. A number of naturally occurring agents such as parasitic insects, spiders, birds and small rodents may attack all stages. Cold winter temperatures, late spring frosts, starvation or disease may also cause the collapse of larval populations. 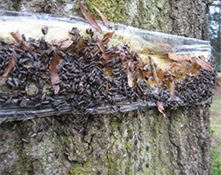 A stick band installed around the main stem of host trees traps the female moths and prevents them from climbing up the tree to lay their eggs. When infestation levels exceed tolerable levels, approved insecticides should be used to target the larvae when they are small.